I clicked. A page in Hungarian appeared. 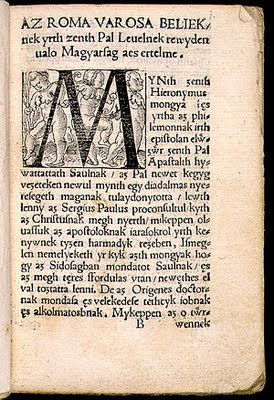 It gives thanks to all who made possible the creation of the Hungarian version of Wikipedia. The producers feature a few statistics. Evidently the volunteers who made this resource possible compiled more than 10 million drafts over an eight-year period—out of which 200,000 fully-qualified Wikipedia articles were fashioned by more than 179,000 registered Wikipedia editors—helped by countless other commentators, helpers, and readers. There will be a celebration of the appearance of the last of these articles on October 1 in the city of Győr. Well done indeed! Hungary has just a shade more than 10 million inhabitants. According to the English-language Wikipedia, 16 million speakers of the Hungarian language exist across the globe. The Hungarian Wikipedia has its own article on this subject and is more exact. It puts Hungarian-speakers at 10.64 million in Hungary and at 16.71 million world-wide (1980). Nice to have more detail. But having a national version of this free on-line dictionary also brings additional benefits. The image I am showing, from the Hungarian site (here), is a page from the first book ever published entirely in the Hungarian language (in 1533). Its spelling is as strange and antiquated as that of any document that is as old. Hungary must have been as proud of that book, late although it was appearing, as they are proud today to have their own Wikipedia! To be part of a very tiny group on this globe gives a person odd perspectives, odd moments of pride. People living in Hungary itself represent 0.15 percent of the global population, all Hungarian-speakers 0.25 percent. A hundred-thousand of those 16.71 million individuals (thus 0.6% of that number) live in the United States. I am one of them. Thanks for that comment, Oop. Reminds us that other small and BIG nations are also still building their native-tongue Wikipedias. India has special problems, to be sure, don't you think? English is virtually an official language there, so why bother to hurry. As for Estonia, presumably you started after 1991--therefore you've come a long ways very, very fast! Great Poet, But Was He Babylonian?